60 S UMMER 2018 PracticeLink.com Remarkable people providing remarkable healthcare Physician opportunities Novant Health primary care and specialty North Carolina and Virginia Novant Health is a not-for-profit integrated health system of 15 medical centers, 1,558 physicians in 539 locations, as well as numerous outpatient surgery centers, medical plazas, rehabilitation programs, diagnostic imaging centers and community health outreach programs. Our 26,000 team members care for patients in communities across North Carolina, South Carolina, Virginia and Georgia. 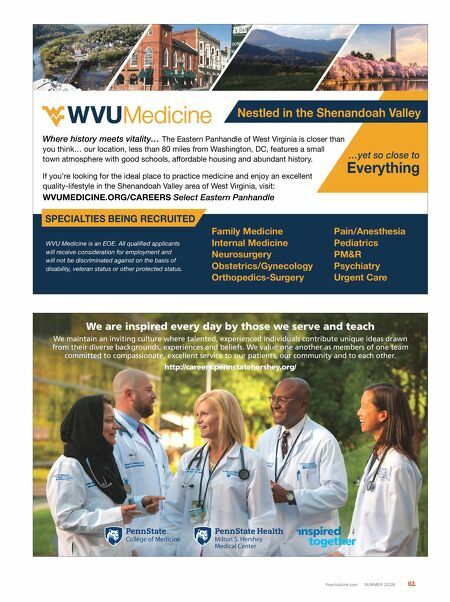 Novant Health offers physicians a fair market value salary package, a relocation allowance, support annually for continued medical education, and a comprehensive benefits package. As a member of our medical group, you will be supported by highly- trained professionals who provide assistance at every level. We will provide you with all the assistance necessary to ensure your success. To learn more about the health system, visit NovantHealth.org or contact one of the recruiters below. Emily Slagle Manager, provider recruitment for Novant Health eclslagle@NovantHealth.org Physician recruitment Samantha Brown - samantha.brown@NovantHealth.org Cher Chambers - cldelaney@NovantHealth.org Stephanie Floyd - skuykendall@NovantHealth.org EOE important to you, then ask if the physicians mingle outside of work, says Allen. Becoming familiar with other staff members, even making friends, can be a crucial part of fitting into a new workplace. 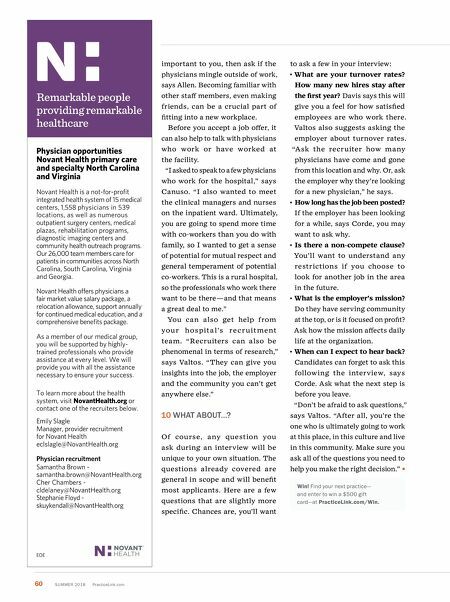 Before you accept a job offer, it can also help to talk with physicians who work or have worked at the facility. "I asked to speak to a few physicians who work for the hospital," says Canuso. "I also wanted to meet the clinical managers and nurses on the inpatient ward. Ultimately, you are going to spend more time with co-workers than you do with family, so I wanted to get a sense of potential for mutual respect and general temperament of potential co-workers. This is a rural hospital, so the professionals who work there want to be there — and that means a great deal to me." You can also get help from you r ho spit a l's re c r u it ment team. "Recruiters can also be phenomenal in terms of research," says Valtos. "They can give you insights into the job, the employer and the community you can't get anywhere else." 10 w HA t ABOU t …? Of cou rse, a ny question you ask during an interview will be unique to your own situation. The questions already covered are general in scope and will benefit most applicants. Here are a few questions that are slightly more specific. Chances are, you'll want to ask a few in your interview: • What are your turnover rates? How many new hires stay after the first year? Davis says this will give you a feel for how satisfied employees are who work there. Valtos also suggests asking the employer about turnover rates. "Ask the recruiter how many physicians have come and gone from this location and why. Or, ask the employer why they're looking for a new physician," he says. • How long has the job been posted? If the employer has been looking for a while, says Corde, you may want to ask why. • Is there a non-compete clause? You'll want to understand any restrictions if you choose to look for another job in the area in the future. • What is the employer's mission? Do they have serving community at the top, or is it focused on profit? Ask how the mission affects daily life at the organization. • When can I expect to hear back? Candidates can forget to ask this following the interview, says Corde. Ask what the next step is before you leave. "Don't be afraid to ask questions," says Valtos. "After all, you're the one who is ultimately going to work at this place, in this culture and live in this community. Make sure you ask all of the questions you need to help you make the right decision." Win! Find your next practice— and enter to win a $500 gift card—at PracticeLink.com/Win.